It reads like a storyboard for a cartoon, I can picture a little cloud of dust rising up when the cook flops down on the dustbin. Reminds me a little of Catcher in the Rye where Holden Caulfield talks about shaking hands with a guy who “tries to break all forty of your fingers”. 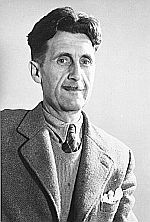 No one much talks about Orwell the entertainer.